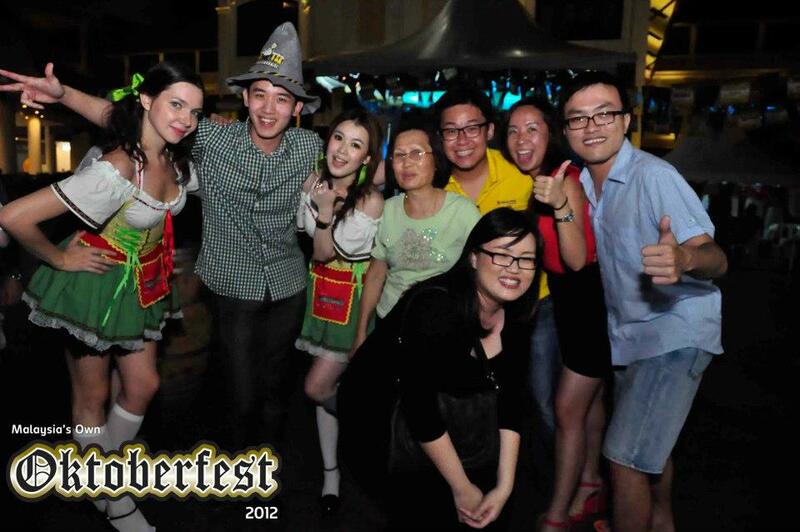 Remember my last post about Malaysia’s Own Oktoberfest at Brussels, Jaya One? 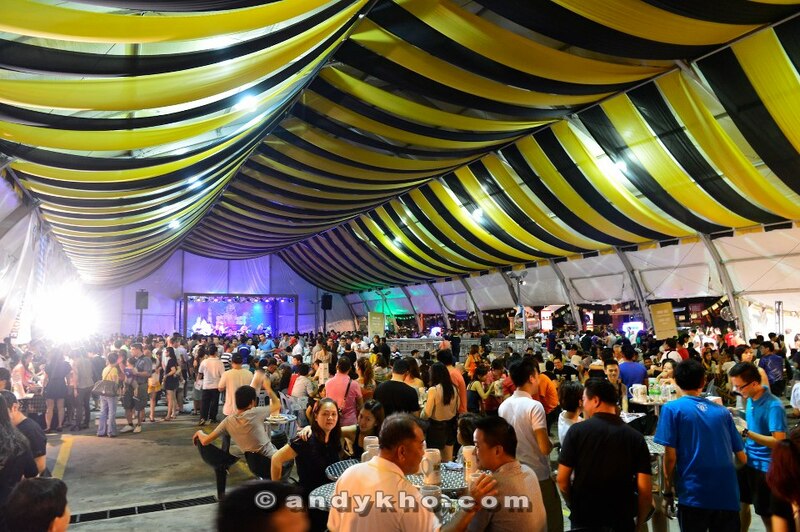 Well, over the weekend the Finale of the 2-week-long celebration was held at One Utama Old Wing Car Park. Proudly brought to you by Carlsberg, this event kicked off at Hakka Restaurant on the 26th September, all the way til 7th October. 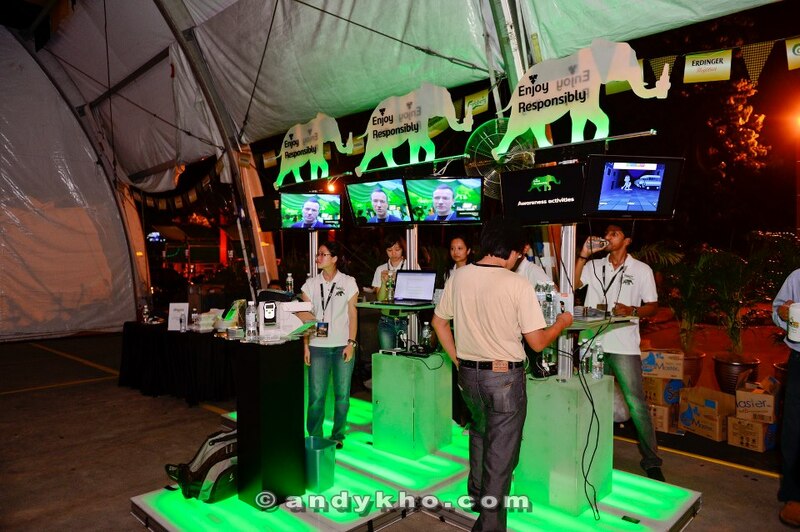 The parties were held in various spots around the country, including East Malaysia too. Yeah I did say the Car Park. Very creative idea I must say. It was completely transformed. This was at 9pm. The crowd grew even bigger later on! It was literally a sea of people, or like what we say in Chinese: 人山人海. Smiles and laughters all around and everyone was eager to partipicate in the Chicken Dance, and the sing-alongs. The Umpapa Band, hails from Germany also got us on our feet with their own enthusiasm. They never cease to amaze me. The lead singer also plays the Trumpet and the Saxophone, the Keyboardist surprised me with his renditions of Bon Jovi’s “It’s My Life” and ACDC’s “Highway to Hell”. 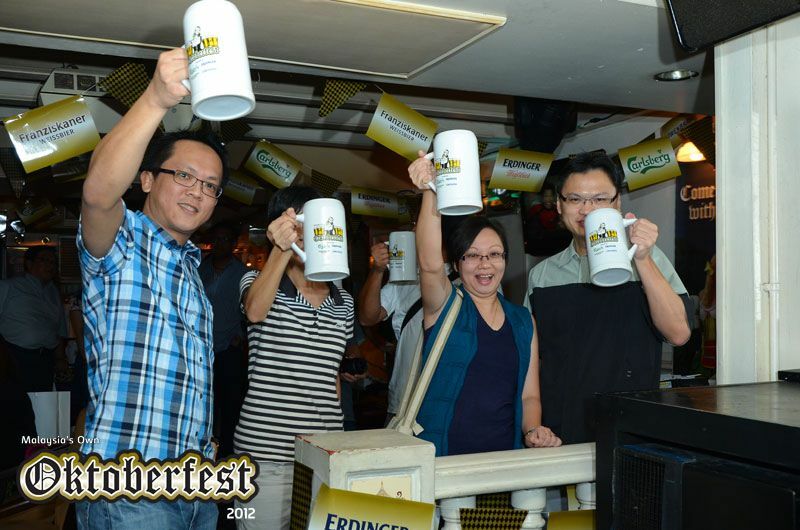 There are four types of Beers available at the Party: Carlsberg, Erdinger Weissbier, Franziskaner Weissbier, and Lowenbrau. Read more about them here. My choice? Lowenbrau of course. 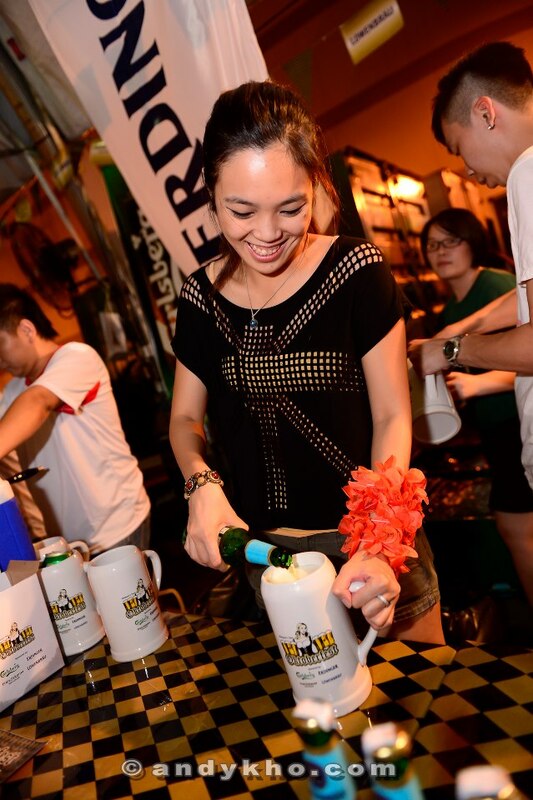 Here’s Louise pouring Lowenbrau like a Pro! The Beer Steins are for us to keep too. I have collected quite a few, you’ll see why later. And that’s not all! 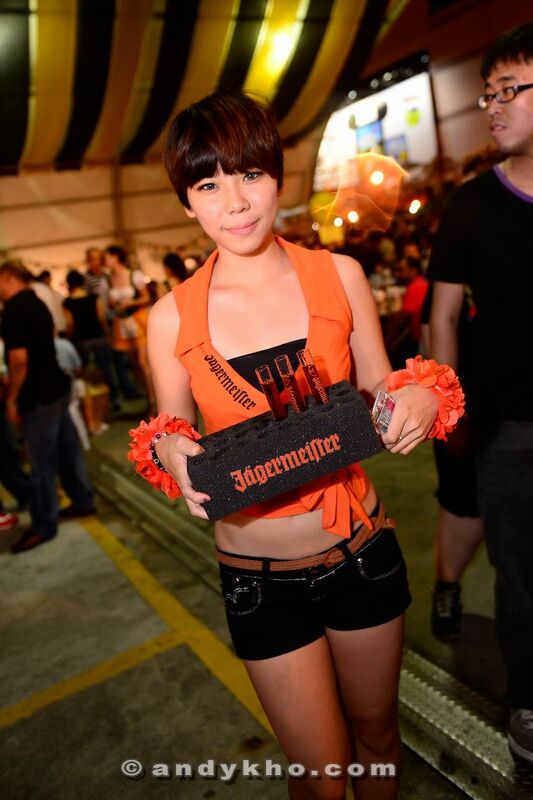 Jägermeister , a German (35% ABV) digestif made with 56 herbs and spices, was also offered, for the authentic Jägerbomb experience (original dunked in Beer instead of Red Bull). A booth was set up for BAC (Breath Alcohol Content) testing, creating awareness and reminding us to enjoy responsibly. 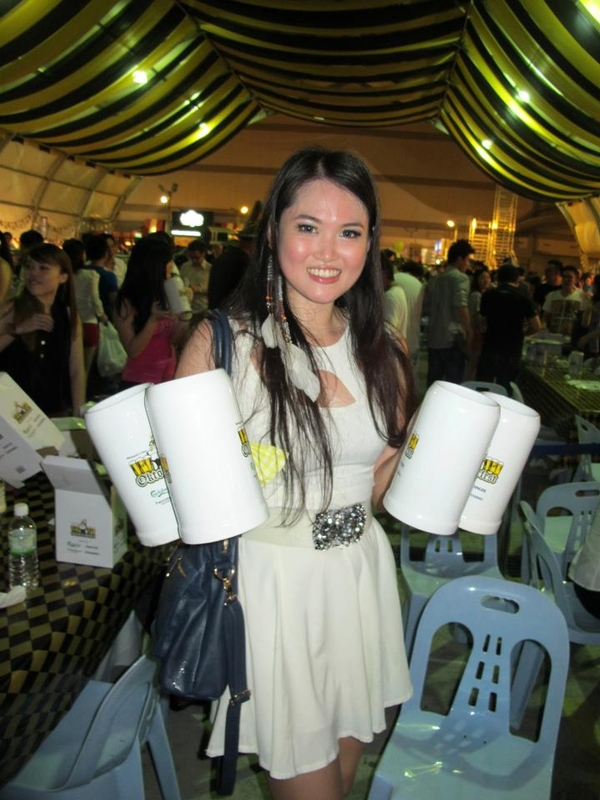 Along with that, free mineral water was given out too. I’d probably have failed the test miserably, but I wasn’t driving! This time, rather than describing the party to Frank afterwards, I dragged him along to join the fun. He was impressed at the scale of the party, the band sang his favourite songs, and I even made him Chicken Dance with me. Heehee. Evidently having lots of fun! Ralph was raving about the food and eagerly dragged Evelyn and I over to the food train and selected a variety of Meaty delights: Sausages, Kassler Ham, Meatloaf. I don’t think I’ve ever had so much meat in one seating! Indeed Ralph was right about the food. 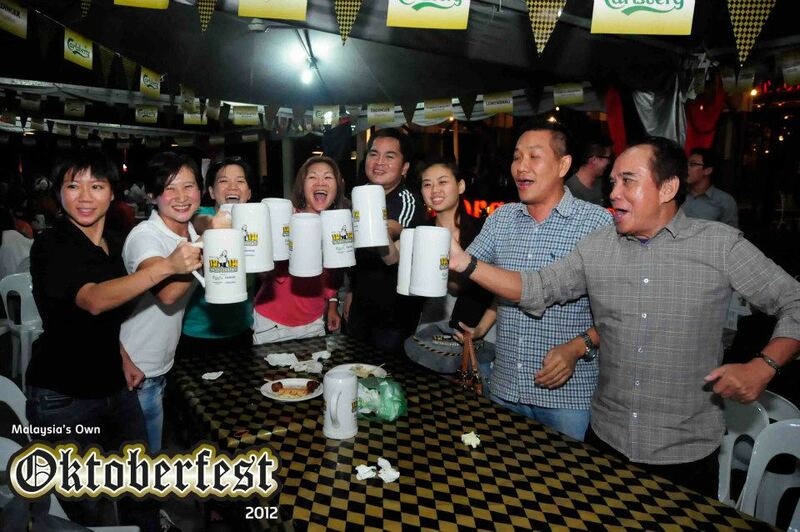 It all adds to the authentic Oktoberfest experience too. Evelyn, who came with a bunch of her friends had a lot of good things to say about the party. It felt like they’ve been transported all the way to Europe. 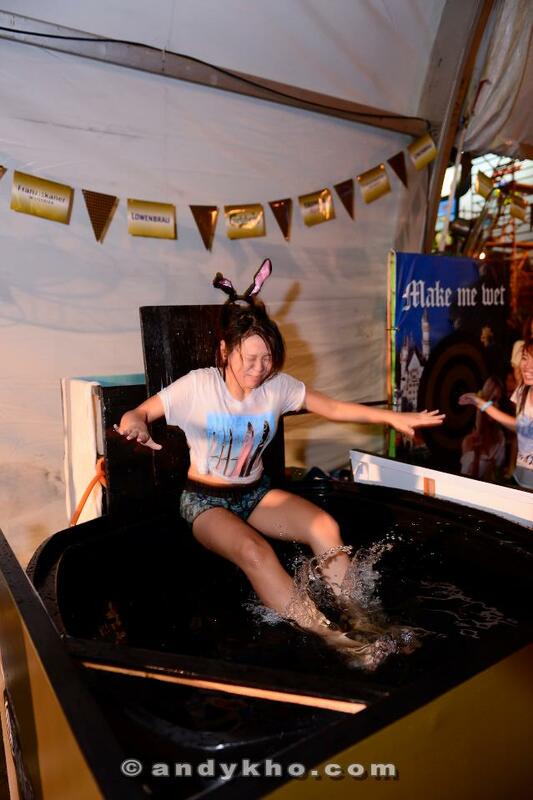 There were many interesting games, and she definitely had a great time at the “Make Me Wet” Dunking Machine. One of them manage to drop the girl into the water. She also liked that the band suited the theme, and really made an effort to connect with the crowd. If you could to hit the ball in the middle, down she drop into the water! There are other games such as Barrel Race, Stein Race but this really takes the cake! Kudos to the fun-loving girls who agreed to this. It was hilarious! An eye-opening experience for me too. The Girls and I tore up the dance floor and literally danced the night away. My body is still hurting from all the activities. But I have not had so much fun for a long time! Definitely worth all that sweat. As usual, group pic with all the MHB girls, we had a blast! The Girls with Tim and Andy. 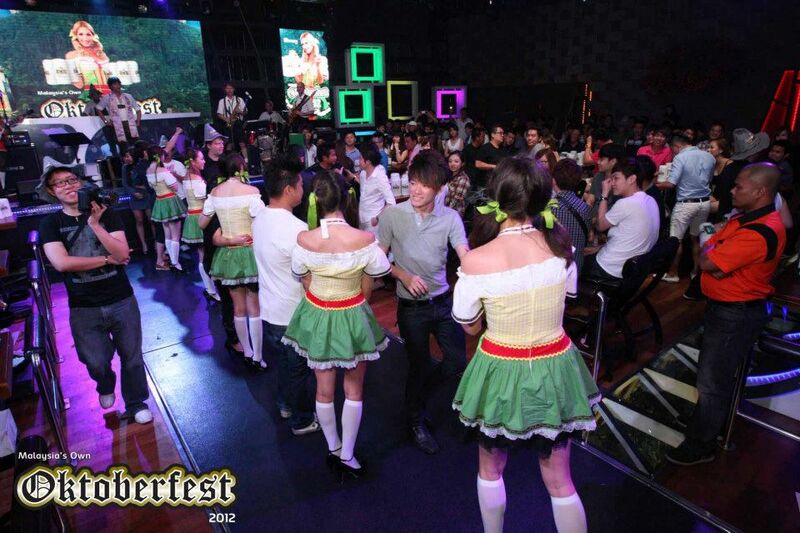 Check out the pictures from the Oktoberfest parties all around the country! All cheers for Batu Pahat! 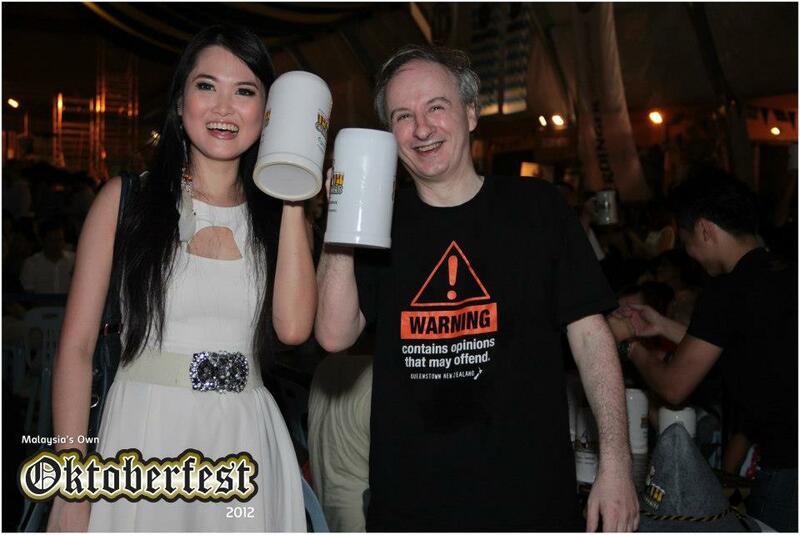 All photos credit to Andy Kho and Malaysia’s Own Oktoberfest’s facebook page. Oh, and by the way, Helga did come to the party with me and hung out for a little while. I cannot stress enough: Drink Responsibly, don’t put your life (and others) at risk. Take a designated driver, or a cab if you plan to drink a little more. Jaeger in test tubes!!!! Win!!! Hahaha i wonder if there’s any bar out there that serves its drinks with a chemistry theme – flaming lamborhinis with a bunsen burner to set it on fire, drinking out of conical flasks and beakers 😀 btw happy birthday kel?? I think The Croft Institute does something like this…. .have you been to the place? Thanks btw!